Alexandre Henrard of France and Sophia Hernández of Guatemala topped the podium at the International Open Trophy Iberoamericano on March 24. 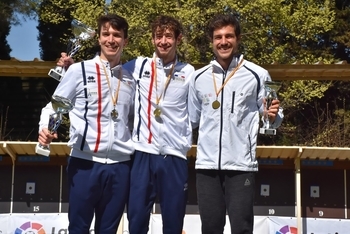 The competition, hosted in CAR Sant Cugat, Barcelona by Pentathlon Spain, was the third senior international ranked competition this year and attracted 33 male and 20 female athletes from 12 nations. In the women’s event, Hernandez (GUA) enjoyed a comfortable victory over her compatriot Ximena Dieguez (GUA) with local favourite Laura Heredia (ESP) finishing third. In the men’s event, a stunning Laser Run from the in-form Henrard (FRA) enabled him to ease to another gold medal, a week after his success at the French Open Tetrathlon Criterium in Paris (FRA). Behind him, silver went to his team-mate Simon Casse (FRA) while Aleix Heredia (ESP) scored another podium finish for the host nation with bronze.